Once you're old enough to get past the distaste for liver that seems to come built in to every kid, it's a surprisingly enjoyable cut. Whether you favor beef, pork or calves' liver, the secret to keeping its flavor mild lies in not cooking it past a still-pink medium. 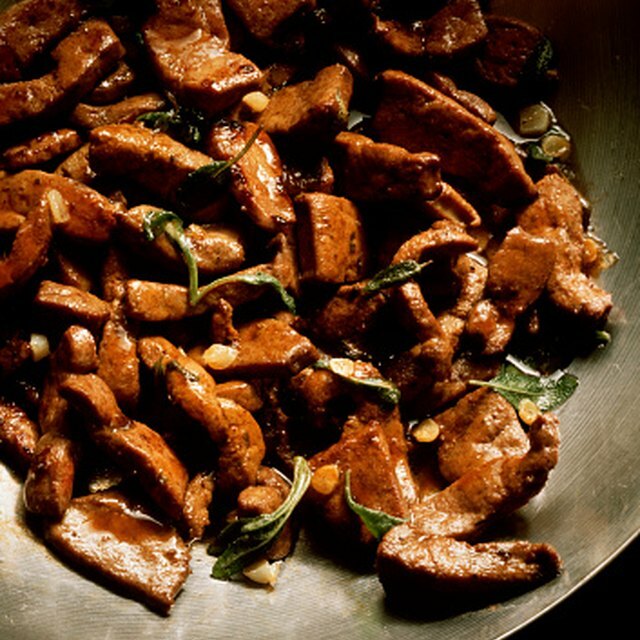 Most home cooks pan-fry or saute their liver, but the smell of fried liver can linger for hours in your kitchen. Cooking it in your oven instead takes a bit longer, but doesn't perfume your kitchen quite as thoroughly and requires little hands-on attention. Rinse the liver slices gently under cold, running water. Place the liver slices in a medium or large mixing bowl and cover the liver with cold milk. Cover the bowl with plastic wrap and allow the liver to soak for about one to two hours. While optional, this process helps mellow the often strong, bitter flavor of beef liver, making it more palatable for children and others who might be wary of eating liver. Slice one or two large onions into rings. Cut each end from the onions and remove the papery skin. Cut the onion crosswise to make rings. Pre-heat your oven to about 375 degrees Fahrenheit. Grease a baking dish with olive oil or a similar cooking oil rubbed on with a paper towel. Use a baking dish large enough to lay the liver in the pan in a single layer. Line the bottom of the baking dish with about half of the onions placed in a single layer. Remove the liver from the milk. Place the liver slices on a cutting board and gently pat them dry with a paper towel. Sprinkle your choice of spices, such as salt and pepper, evenly on both sides of the liver slices. Place the liver in the baking dish in a single layer on top of the bed of onion rings. Lightly coat the liver with olive or cooking oil. Top the liver with the remaining onions arranged in a single layer. Place the baking dish centered on the oven baking rack. Bake the liver between 15 and 20 minutes for thin slices, or 30 to 35 minutes for thick slices, until it's cooked but still has a hint of pink inside. You can check by cutting into a section of liver with a knife to see if it's ready. If you'd rather not take a knife to it, you can consider the liver done when pink liquid begins to rise from the top, and you can easily pierce it with a knife or fork. Remove the baking dish from the oven when done. You can serve it from the baking dish or transfer the liver and onions to a serving plate. If desired, arrange bacon in a single layer on the bottom of the baking dish before adding the first layer of onions. Top the dish with bacon slices arranged over the top layer of onions. Layer in this order: bacon, onions, liver, onions and bacon.